Try keeping up with Neal Morse and you may have to catch your breath. The gifted musician and prolific composer is in full stride, seemingly unstoppable. Certainly, that's what his seventh solo album of progressive of rock, Momentum, would suggest. Momentum once more proves that Morse, in the company of longtime friends Mike Portnoy and Randy George, is a master of progressive rock. His music is as much as easily identifiable with him as it is also creative and fresh. This is notable on Weathering Sky where heaviness is juxtaposed against a soaring, melodic, vocal arrangement. But also on the following song Freak, which is as much prog as it is accessible melodic rock. It's also a fine example of how Morse explores his Christian faith with honesty and gentleness. Then there's the lighter, acoustic driven, Smoke & Mirrors, which takes a page from early English prog. Momentum wraps up with a typical Morse conclusion, an epic song in six parts, World Without End. In these 33 minutes, you hear Morse's signature style. He deftly blends his keyboards with guitar, moments of atmospheric grandeur with metal-like heaviness, thoughtful lyrics flowing through versatile vocal arrangements. With this song, as with the album as a whole, I'm even more impressed with how well Neal can sing. Guitar solos are done by Adson Sodr�, one of three musicians who won auditions to be part of Neal's touring band. Overall, Momentum is simply quintessential Neal Morse, a modern master of all things melodic and progressive rock. Strongly recommended. 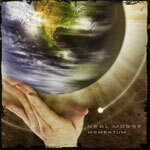 Momentum is simply quintessential Neal Morse, a modern master of all things melodic and progressive rock. Strongly recommended.